Manufacturer Part Number. Since it is Pre-Owned; may show signs of use. Trending at $41.90eBay determines this price through a machine learned model of the product's sale prices within the last 90 days. 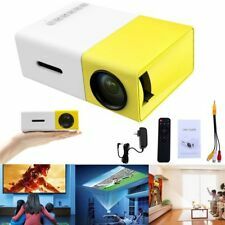 Portable Intelligent Home Theater projector, US Stock!! Big good news! Buy projector,get free 60" projector screen 16:9. Only 3 pieces of the free projector screen. Projector Screen. Projector Accessories. Portable16:9 Projector Screen 60"/72"/84"/100". 2In1 5000 Lux DVD Projector Full HD LED Video 1080P. Wireless Fish Detection Sonar Bluetooth Finder. 720P Wireless WiFi DoorBell Smart Video Phone Door. Support 1080P And 4K Video Display. In addition, it supports Full HD 1080P (1920 1080) and 4K video playing. Trending at $37.46eBay determines this price through a machine learned model of the product's sale prices within the last 90 days. Model: PJ308W. screen size using its HDMI, VGA, USB and A/V ports. Easily adjust the picture for the best viewing angle with manual focus and angle correction. Connect your speakers to the audio out or use the built-in speaker to complete the scene. WIFI display------Android Smartphone. Product Type Portable DLP Smart Theater Projector. 802.11 a/g/b/n/ac 2.4G 5G Dual band WIFI. Let your projector like a computer in your hand. Office Projector. Wireless Display,support sync phone screen to projector. High Brightness For Best Projection Effect. 12 Stitch Electric Overlock Sewing Machine Household Quilting Tool w/ LED Light. but its screen is adjustable from 32” to 130” with the projection distance between 1m and 4m. Its dual HDMI ports let you connect multiple computers or HD devices. This RCA projector has a sleek design to fit into tight spaces and is easy to transport from room to room. 3000:1 contrast ratio Provides a multitude of shades between black and white for rich color saturation. Audio Formats: MP3, WMA, OGG, AAC, FLAC, APE, WAV. Support aspect ratio between both 16:9 and 4:3. Interface: 3.5mm Audio,HDMI,TF Card Slot,USB. Projector system: Led. Built in lithium battery: 7.4V/1300mAh. LG PH550 HD Projector - Bluetooth Sound, Built-In Battery, Wireless Screen Share. MFG Part #: PH550. Digital TV Tuner. Bluetooth sound out. Wireless Connection with Android O/S, WiDi. HD 1280x720. Multi selection of inputs: HDMI, VGA,USB, AV,SD. This Mini LED Projector is convenient to carry with a lightweight and portable design. With 3 pieces glass, the projector can show a clear image for you. MULTI-FUNCTION INTERFACE: VGA, AV, SD, USB, HDMI. Connectivity Interface: VGA, AV, HDMI Inputs. CONNECTS DIRECTLY TO DVD, GAMING CONSOLE, PC, OR LAPTOP/COMPUTER. Connects to PC, Laptop, DVD, Gaming Console & More. Connections: 1 x USB Input (plays Audio/Video/Image files from USB device), 1 x USB Power (5V), 1 x AV input, 1 x SD Card Slot, 1 x HDMI input, 1 x VGA input; 1 x Headphone/Audio Out; Built-in Speaker. ONE PROJECTOR DOES NOT HAS REMOTE BATTERY COVER. THERE ARE SMALL SCRATHES ON PROJECTORS. High compability: Support 1080P, Audio: WMA, MP3; Image: JPEG, BMP, PNG; Video: MPEG1, MPEG2, MPEG4, RM, RMVB, AVI, FLV, WMV. Our projectors can work 12 hours continuously, to protect our eyesight and prolong the lifespan of the projector, we'd like to suggest that you shut it off for 10 minutes after it works over 4 hours continually. 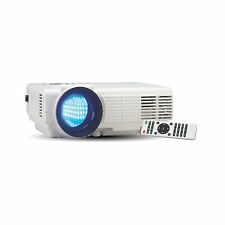 RCA LED Home Theater Projector 1080p 2200 Lumens NEW!! RCA LED Home Theater Projector 1080p 2200 Lumens NEW!!. Condition is New. Shipped with USPS Priority Mail. 【Quick Installation & Simple Use】 Ceiling/ front/ rear projection is available. User friendly: ±15°Vertical keystone correction, you can get a rectangular image at any projection angle; 25 levels digital zoom, reduce image size without moving the projector; flip function: you can reverse the image for ceiling mounted. 4200lms Android 6.0 Bluetooth WIFI Projector. HD Smart Android LED Projector Video Wifi Bluetooth. This model can do that. The image will be clear enough even with lights on or curtain down. Active Shutter 3D Glasses for DLP-Link Projector. SUPPORTS 1080p RESOLUTION. -HDMI INPUT! THIS PROJECTOR WILL WORK WITH -PC 3D Ready! -OUTDOOR / BACKYARD MOVIE NIGHT. -DVD / BLU RAY PLAYERS. -CAMCORDERS / HANDHELD VIDEO RECORDERS. -PC / MAC DESKTOP AND LAPTOP COMPUTERS. Kllarmant 1920x1080p Projector with Power Cord and Manual. Up for sale is a slightly used projector from Kllarmant, it can go up to a 1080p resolution without distortion. An integrated smart stand provides for simple 360-degree setup, while also doubling as a lens cover. A built-in safety feature temporarily turns off the lens when objects are detected too close to the projector. Advanced DLP 0.3” DMD projection technology and 854 480 native resolution. It compatible with 1080P, which can present crystal clear HD images for you;. Mirroring Through USB Cable Directly. Projection Distance and Screen Size. When you connecting it with wifi, surf the internet, watch online videos and pictures are both available. Besides, built-in Bluetooth 4.0 enables BL46 connect with bluetooth speaker wirelessly either. 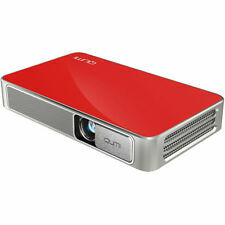 RAGU Z720 HD video projector is very easy to operate. Know more specifications before taking RAGU Z720 is more convenient to use with HDMI, VGA and USB ports. 1 x RAGU Z720 Projector. Movie format: MPG/AV/TS/MOV/MKV/DAT/MP4/VOB (Max. ).